Whether buying or selling a house, find a real estate agent who knows the area and works within a similar range of desired housing styles, price range or neighborhoods.Another good indicator of expertise is membership in the National Association of Realtors. Look for the registered trademark Realtor® designation. This indicates adherence to a specified code of ethics, specialized education and training, and more. Find a Realtor who offers a balance of professionalism, experience and a style that suits your preferences. Most people want a “mover and shaker” who gets out there, shows a lot of homes, return calls promptly, reports progress, has connections and is well-known and respected in their field. Some prefer an assertive agent who will leave no stone unturned. However, others are more laid-back and prefer a knowledgeable but leisurely guide with plenty of patience for novice buyers or sellers, or others who just want to take their time. Trust your instincts. If you feel uncomfortable, move on. If a real estate agent is good, people in the community will know! Buying or selling a home is a major investment. It’s worth the time to shop around. Use this guide to develop a short list of Realtors to interview by phone or in-person. Ask neighbors, friends, family and colleagues for references. Ask for a short list of pros and cons. What’s right for someone else may not be right for you, but it can be the start of a short list of prospective agents. Consider Realtors met at an Open House or from past relationships formed while buying or selling a home. Contact established local real estate firms. Ask the manager for recommendations, but be specific about the qualities and experience required. Check classified ads, neighborhood signs, or the online sites of reputable firms. Ask experts in the industry, such as mortgage brokers, financial, legal or accounting experts, or home builders. Attend a class on buying or selling a home taught by a local Realtor. If his or her style suits your needs, request a personal informational interview to learn more. Find real estate agents at web sites such as HomeGain.com, which help narrow the list and allow users to compare agents anonymously. A web search and phone interviews with Realtors can narrow your list further. Then, schedule a few office interviews with agents from reputable firms. Avoid interviewing two agents from the same office, however, as this can cause conflicts. Whether you want to sell or buy a house, a face-to-face interview is a great way to determine whether a Realtor’s approach suits your style. Ask for background information, credentials, years and type of experience and expertise, and an overview of how the process works. Clarify what agreements, contracts, terms and options are available. Be prepared to share your own expectations, as well as the type of home, neighborhood and price range, if you’re buying a house. Trust your instincts. If personalities clash, it usually comes across in initial calls and meetings, or by checking references. Numbers matter, too. Ask about a real estate agent’s sales volume and other professional criteria, plus payment terms and written agreements. It’s important for all parties to be clear about expectations. Ask a lot of questions. Tell the agent what you need and what you expect. 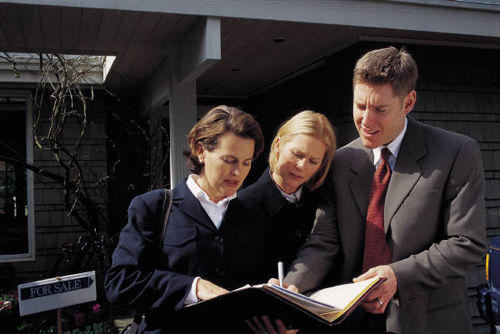 Find a Realtor who is happy to answer questions and explain the plan, process and protocols. Communicating well includes listening carefully and being responsive to specific needs. Avoid over-zealous salespeople who try to show a house or property just to close a sale, whether it’s a good fit or not. For example, if home buyers want to find a house with a fenced yard for Fido, 3 bedrooms for the kids, and an attached 2-car garage, they don’t need to see sprawling acreage or small condos. If you’re a home buyer who is allergic to cats, you needn’t waste time (and Kleenex!) touring a house with scratching posts and pet dander. Similarly, if a homeowner wants to sell a stately Victorian fixer-upper that “needs TLC,” but a salesperson wants to sell it to senior citizens seeking to simplify and downsize, it’s not a good match. Stick with a Realtor who listens closely and then shows you what you need, not what he or she wants to sell. Find a Realtor who stays current with technology, too, including communications tools that help stay ahead of the crowd and share the latest updates and information with you. When meeting with Realtors, strive for a win-win relationship. Be your own best judge and choose a price and timing range to suit your budget, schedule and comfort level. Remember that selling agents are motivated to sell their own listings or may have other conflicts of interest. Be cautious about confiding personal top or bottom-dollar limits. Leave room to negotiate. Take your time. If an agent pressures you, it may not be a good partnership. Read contracts carefully, too. Learn more home-selling basics before interviewing professionals. If buying, consider a buyer’s agent. These real estate professionals have specialized expertise and a commitment to represent the buyer’s interests. Agents who list and sell homes may have conflicts of interest in favor of home sellers or a particular company that are not always disclosed to buyers. A designated buyer’s agent is dedicated to representing the buyer through every step, from house hunting, negotiating and financing to inspection, contracts and closing details. A buyer’s agent will show homes from the industry-standard Multiple Listing Service (MLS) directory, as well as “For Sale by Owner” (FSBO) homes and other properties. The National Association of Realtors designates Accredited Buyer’s Representatives (ABR®) who offer buyer-focused services. Check the Real Estate Buyer’s Agent Council directory of accredited buyer’s agents, or the National Association of Exclusive Buyers Agents (NAEBA). Before scheduling interviews, learn the basics and find tips for first-time home buyers. Before signing a contract, read it carefully. Watch for added fees above and beyond the commission. Make sure it has a release clause allowing parties to move on without penalty if either is unhappy with the services or if other problems arise. This is a wise precaution that most professionals will understand.However, doing advance research increases the chances of a good relationship and a great transaction for all involved. Consider it your first down payment on the home – or home sale – of your dreams! © 2015; originally published at Suite101.com – reprinted with permission. This entry was posted in Real Estate & Home and tagged Real Estate by MikeR66. Bookmark the permalink.